The West Virginia University School of Dentistry is proud to announce two of its residents are one step closer to joining an elite group of dentists who specialize and are board certified in endodontic treatment. Dr. Travis Moore, who earned his DMD at East Carolina University School of Dental Medicine in 2016, and Dr. Mike Tran, who earned his DDS from the University of Southern California in 2014, are the chief residents in the dental school’s Department of Endodontics. They are in their final few months of a 30-month program developed to provide them with advanced education in diagnosing tooth pain and performing root canal treatment. According to the American Association of Endodontists, fewer than three percent of dentists complete an advanced education program and earn board certification signaling they are experts in pain management and using cutting edge technologies to treat dental pulp complications and diseases. Moore and Tran will receive their Master of Science and a Certificate of Specialty in Endodontics in December. To become recognized as a board certified endodontist by the American Board of Endodontics (ABE), however, residents must complete ABE’s three-step process in addition to the completion of their masters and residency program. That three-step process includes a 200 question written exam, review of at least 10 clinical cases with specified procedures and an oral examination. 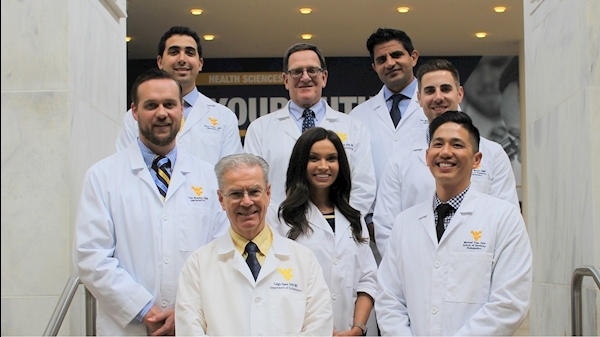 Dr. Cade Brawley and Dr. Mehran Malakpour are one year behind Moore and Tran as second-year residents of the WVU School of Dentistry. Brawley earned his DDS from the University of Texas Health Science Center San Antonio in 2011. Malakpour earned his DDS from WVU School of Dentistry in 2017. Dr. Michelle Romeo, a WVU School of Dentistry graduate in 2013 and Dr. James Poulos, a 2018 graduate of Ohio State University College of Dentistry, just began their residencies. To inquire about an appointment, call 304-293-6208.